Then many who heard [Jesus] say these things believed in him. 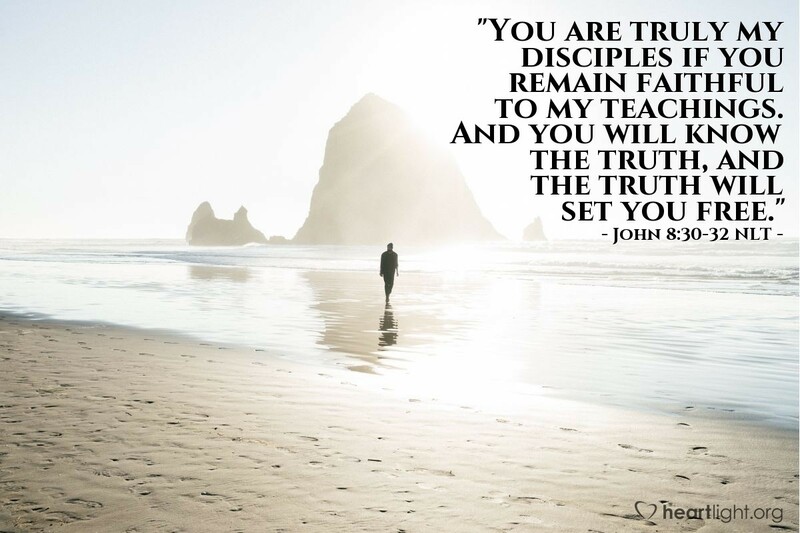 Jesus said to the people who believed in him, "You are truly my disciples if you remain faithful to my teachings. And you will know the truth, and the truth will set you free." What is the secret to knowing the truth? Doing what Jesus says! It isn't in discovering a new idea, coming up with a new plan, or going in search of some lost mystery. Knowing the truth is found in living Jesus' teaching. The proof is in the doing! Father, give me a heart to obey Jesus' teaching. Give me a heart to obey even when I don't fully understand the reason behind his teaching. Give me a heart to obey even when I don't feel I fully have the capability of pulling it off. I know that so many of the valuable lessons I have learned from you have come when I trusted and obeyed. Bless me now as I seek to put trust and obedience into practice more fully in my life. In Jesus' name. Amen.